Jill Dimond lives in Ann Arbor Michigan, and hails from rural Western Michigan. The logo for her company, Sassafras, evokes the shape of the state of Michigan. After a degree at the university of Michigan, she moved into industry, working on the App Inventor project, and then completed her PhD at Georgia Tech in Human Centric Design in 2012. Most recently, Jill is a worker owner at Sassafras Tech Collective, a worker owned technology cooperative based in Ann Arbor, and they focus on research and technology for social justice. 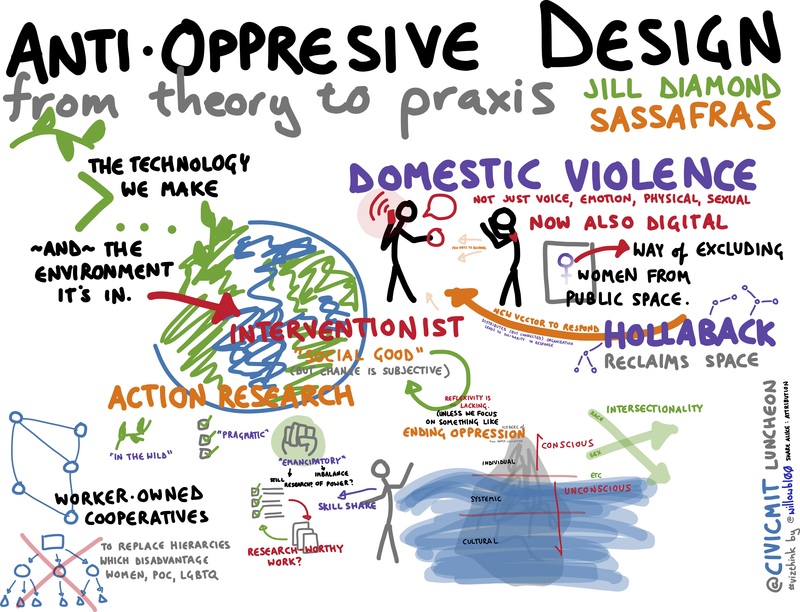 Jill’s talk today focuses on the idea of Anti-Oppressive Design (she and Thomas Smyth wrote about this topic for ACM interactions last December). This is an approach that considers both the values embedded in technological design and the environment that surrounds how a technology is built and researched. Human computer interaction research is now in a third-paradigm, one that recognizes that knowledge of technologies comes from environments, not from any sort of inherent knowledge. This paradigm is associated with a range of movements that consider technology as a tool for social change, including socially responsible technology, tech for disaster relief, for civic action, for behavior change and ICT4D. All these approaches seek to instill certain values in their technologies, and center on the idea that these technologies are creating social goods and furthering social change. This third paradigm of HCI is within an interpretivist paradigm of sociological change. These approaches are in a liminal space between interpretivism and radical humanist and radical structuralist paradigms. 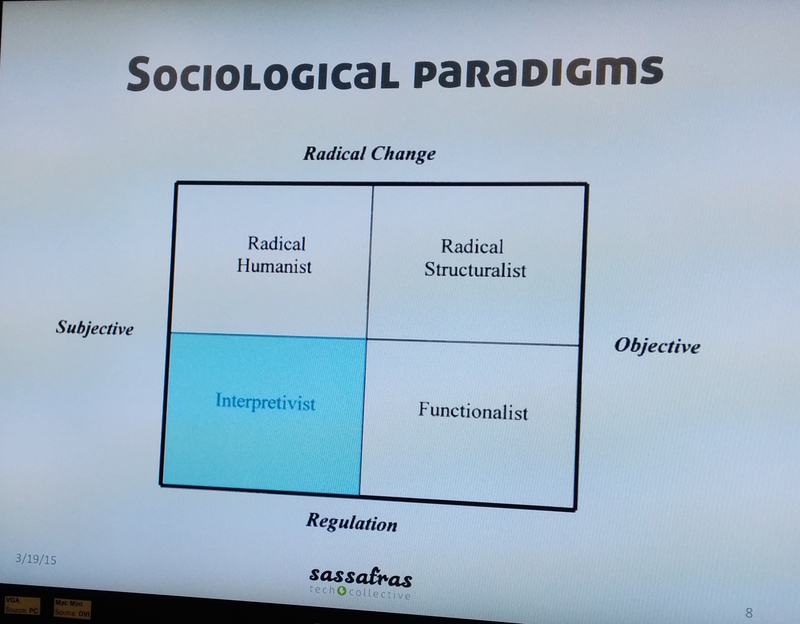 The radical humanist paradigm sees a need for social change, while the radical structuralist goes further and offers recipes for this change. Today’s talk focuses on the question of how we end oppression with technological systems, and how Jill’s work around gender-based violence and with grassroots activists led her to this insight about designing systems and building a worker-owned cooperative. Her talk will be followed with breakout discussions about how we might apply anti-oppression thinking to academia and other workspaces. Theories of oppression have come from many social movements, particularly black feminist thoughts. Using Patricia Hill Collins‘ work, oppression includes discrimination against whole social groups, supported by institutions and structures; sexism, racism, classism, ableism, colonialism all fit within a broader set of oppressions. These oppressions occur at different sociological groupings. When we consider an issue like transgender oppression, it includes oppression at an individual level, when parents don’t let boys wear feminine clothes or engage in feminine activities. At the systemic level, we see oppression through the medical system where insurance systems do not support trans identities. Further down is cultural oppression, where the unwillingness to separate physical and gender identity is encoded within cultural structures. Privilege and oppression are closely related—we might consider settings on a video game. The easiest way to play the game of life is as a straight, white, Christian, able-bodied male. You can be discriminated against, but you face fewer structural barriers. You have a better chance of getting a good education, getting a loan or having access to health care. A fake app called Well-Deserved is designed to let people cash in on their privilege. Men can charge women for walking with them to help avoid street violence. White people can charge people of color for the service of hailing them a cab – it’s a way of valuing the benefits of privilege. Privilege is intersectional—each individual derives varying amounts of penalty and privilege from different forms of oppression. Women of color deal with sexism, racism and classism when they enter spaces like the world of the high tech workforce. Given the history of racism and sexism, women of color might be perceived as more sexualized than white women in the same setting. Addressing oppression is different from providing social services. Social services work on meeting immediate needs; social justice focuses on making long-term changes to the root causes. Lili Irani’s work on Turkopticon helps ensure Mechanical Turk workers receive payment. Jill’s work focuses specifically on gender-based violence, in part through her work with Hollaback. As someone who worked in the high tech industry, she’s acutely aware of the gender disparities within the tech industry. She was concerned that there is insufficient research on technology and oppression. In 2010, she conducted a study on technology and domestic violence [pdf], revealing that social technology can create new channels to threaten and abuse. Survivors were actively deploying tactics to counter this violence—switching phones, using aliases, limiting time online. These tactical responses don’t work on the root issues of oppression of women through domestic violence—she wanted to find solutions beyond support systems via social media. She started finding the sorts of projects she was seeking when she encountered Hollaback, an organization focused on countering street harassment through documentation and storytelling. You may think of street harassment as catcalling, but it can include severe verbal assault, groping, and other more aggressive phenomena. The term “street harassment” is relatively recent, and helps describe a broader sphere of violence that limits participation in public space (see Sidewalks, by Anastasia Loukaitou-Sideris and Renia Ehrenfeuch). These incidents show sexism, racism, and the policing of women in public space. Hollaback is global in participation, and highly decentralized. 65% of leaders are 25 or under, 44% identify as LGBTQ, 26% identify as people of color. The site has been very successful at encouraging participation of people who are not normally in positions of power. She shows us the Hollaback site in Buenos Aires as an example of local control over the platform. The site’s name has been translated as Atravete, which roughly translates to “dare to.” The site leaders run their own social media outreach on their own Twitter accounts as well. These local campaigns take on original interventions. She shows us a subway ad that runs in Philadelphia. “Your friend just said ‘Is that a dude?’ Do you say something?” These ads challenge homophobia within public spaces and invite counter-speech. Another example of a campaign are chalk walks, where people add messages to public spaces. Meet Us on the Sidewalk from Kara Lieff on Vimeo. One of the research questions identified around Hollaback was the question of whether sharing these stories has impact on the community or on participating individuals. To understand the impact, Jill and colleagues interviewed women in the US and UK about harassment. People told her that they felt a lack of a way to address street harassment. They were told that they were being oversensitive, or worried that their friends and families would criticize them for responding to harassment. A few worried that if women were experiencing harassment, they would find their movements and freedoms restricted by their families, like overprotective brothers. Three of the people she interviewed sought police support, but did not receive it. By visiting the Hollaback site, the women were able to problematize their experiences. By reading each others stories, they were able to understand harassment as a problem, rather than as a norm. Usually, problematizing an issue is the work of social movement leaders—in this case, the stories were doing the transformation. Jill calls this a “frame transformation,” a cognitive and emotional shift in how people understood and felt about their experiences. Previously, people felt harassment was their fault, or something they simply needed to deal with. Experiencing the stories, they shifted to a different understanding, a realization that routine harrassment was a violation of their freedoms (you can read more of these stories in Jill & collaborators’ CHI paper from 2010). It turned harassment from an individual to a collective experience. Catcalling turned into an international phenomenon and a behavior that’s part of the spectrum of violence. Storytelling allows action to come from the bottom up, rather than from movement leaders. Technology can help assist make invisible experiences of everyday life visible online. Storytelling can help expose the intersections and lived body experiences of everyday life. The variety exposed from this storytelling shows the challenges of applying a single solution to street harassment, given how different the experiences people have can be. Research Approach Jill describes her research approach, hoping that her approach will be useful to other people doing work on anti-oppression. Her work is based on action research (see Reason & Bradbury, eds. 2008, Sage Handbook of Action Research: Participative inquiry and practice.) is an approach that tries to create more participatory communities of inquiry. The action research cycle is similar to iterative design—it involves planning, action, observation and reflection. But this process is applied to the research questions, not just to the design. There are many different kinds of active research, with different knowledge goals and different positions of the researcher. In scientific and technical action research, it’s mostly about testing tech out in the wild, where participants help facilitate the experiment. Pragmatic action research positions researchers as friendly outsiders. The goal is to increase participants’ knowledge or participation in society, drawing on ideas from John Dewey. 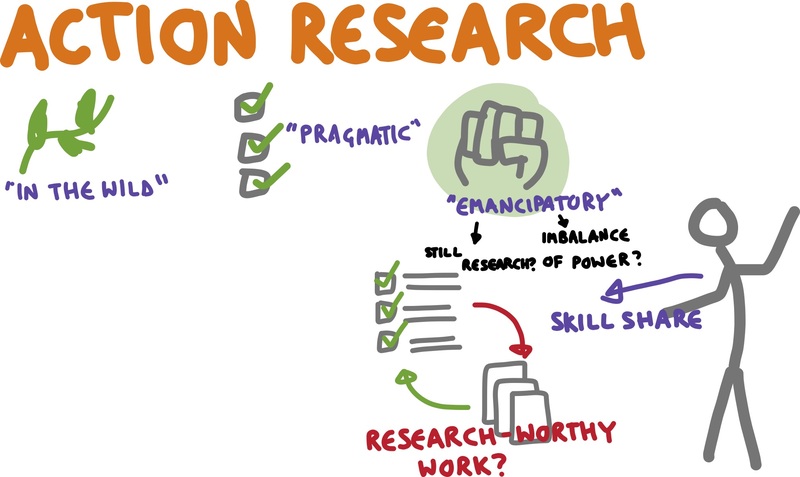 There’s an emancipatory approach to action research, with roots in social movements (See Grundy 1982. “Three modes of action research.” Curriculum Perspectives). It works directly towards ending oppression. Jill thinks of her work as fitting within this last paradigm. The goal is to create technologies with people, not for them, and with the specific goal of ending oppression. Jill serves as technical lead, developing apps, a WordPress multi-site framework, and providing tech support. She co-constructed research questions with the Hollaback activists. And she focused her reflections on whether this work and the technology built was actually working to end oppression. There are challenges to working this way. As someone coming into the activist space, she realized certain privileges associated with technical and research skills. To distribute that power, she conducted many trainings to try to empower others involved with the project. Secondly, part of the research involved performing lots of work that wasn’t directly related to her research, often tech support. Another issue was the validity of the research, and the challenge of carrying out work that would be accepted by academic communities. To address this, Jill realized the need to partner with researchers outside the organization to ensure the research conclusions were valid—these friendly outsiders allowed her to gain a fairer, less-involved perspective on the work. Finally, this is a challenging way to work with funders, who may be more concerned with completing projects than with engaging with certain processes. “How can we address oppression in the workplace?” Hierarchies exist within most businesses—there’s an inherent boss-worker hierarchy. In some companies, there is a toxic culture for women, men of color and LGBTQ in tech. One possible way to address these oppressions in work are worker-owned cooperatives. a model of organization where the workers are also owners. It’s an attempt to bring direct democracy to the workplace. Worker-owners must make decisions together through consensus or direct democracy. There’s a long history of cooperative economics in the US. Jill reminds us of a network of black women’s mutual aid societies as far back as 1790 like the Free African Society. In the 1800s, in response to factory transformation, theUK rochdale cooperative organized around consumer cooperation. Spanish Civil War response included Mondragon, the largest cooperative in the world, which employs 70,000 people in Spain. This is often called the “triple bottom line,” focusing on social and environmental goals as well as on financial sustainability. The Sassafras Technology Collective, which Jill and others founded in now includes three members, two prospective members. Among their projects, they are continuing to work with Hollaback on the storytelling site and other projects. They are working with The Carter Center on a project called ELMO which is widely used in West Africa. Working with a group called Working World which helps start cooperatives around the world. They also work with Columbia Research on Diabetes Detective, focusing on health in low income communities in the US. There are challenges working with worker cooperatives, but some strong benefits as well. Cooperatives work well on economic inequality, but do not necessarily address privilege and oppressions. There’s a hierarchy around prospective versus full members in Sassafras. It’s not a surprise that the three members of the cooperative are white, given historical privilege. They attempt to correct this by giving prospective members participation in new member orientation and training. Flat organizations can fall victim to what Jo Freeman calls the Tyranny of Structurelessness. In a flat organization, those who are most privileged tend to emerge as leaders. There’s a conflict resolution process, a reading list and other interventions designed to build Sassafrass as a structure where people can build and learn together. There is a growing movement of Tech worker cooperatives, and tech is a natural space for coops. There’s lots of work out there, low capital costs for starting a cooperative, and a strong network that provides support and references for other projects. Anti-oppressive design is a way to look at a project’s goodness, its potential for social change. There’s a huge need to be reflexive about whether the work we’re doing actually contributes to social change. Looking at how projects attend to oppression is one way of doing this. Her journey with Hollaback and through emancipatory action research has led to work on worker cooperatives and addressing oppression within. She argues that the revolution starts at home, addressing the environments we work in and ways we can improve ourselves before attempting to change others? An MIT PhD student in electrical engineering who is working on medical device design asks: We have a great design process to execute on a design, but insufficient questioning about what questions we ask. How do we ask better questions about research questions? Specifically, she asks about a collaboration between electrical and mechanical engineering. Questions often involve engaging with clinicians working on problems in their everyday health practice working on problems like malaria. Jill suggests that studying situated approaches to hardware design might be a way to initiate discussions, considering the ways technologies tend to be designed for use by white males. Ed Platt asks a question about the tyranny of structurelessness and the challenges of scaling worker cooperatives. What are the practical solutions to scaling up these sorts of organizations? Jill notes that you can’t do consensus decisionmaking with groups larger than 30. You need some sort of structure, as Occupy discovered. Equal Exchange has a system where workers are voted onto the board of directors, and rotated off. This ensures sharing of power, but also prevents people from becoming too engaged with governance and removed from the work. Rotation of power is very important. Nathan Matias asks about Jill’s continued engagement in research after finishing her PhD. Working at a university offers certain privileges for scaffolding research, which don’t always support emancipatory action research. He is curious about her continued engagement in research outside of a formal academic environment. Jill explains that we always have to find ways to work within existing systems. Sassafras has to pay the bills, but needs to make space to engage in important work, even if that work is done for reasons of passion, not payment. It’s a continual struggle. Nathan reframes his question: When you consider ideas like frame transformation, how does that affect the people working on a project like Hollaback? Jill explains that the study has been used tactically to improve funding for Hollaback. The success of the story-sharing platform has enabled fundraising for different projects around using media to combat harassment. The executive director of Hollaback continues to use those research findings in her talk. Saul Tannenbaum asks about the path from thinking about a cooperative to actually building one. Jill tells us that it was really scary to start out, with a great deal to learn about making a business run. When researching, you’re not concerned about billable hours – you are as a business owner. She knew it would be a challenge to work with others in a flat way, but hadn’t understood how much emotional labor would be involved with that work. In response to a question about how the collective structures its reflection, Jill refers to resources from the Aorta Collective, which provides meeting guidelines to generate shared values and expectations around getting people on the same page with regards to how to engage, and what’s appropriate and what’s not. Leo Burd asks a practical question: how do you think about money when working with people with different backgrounds and areas of expertise? As worker owners as Sassafras, Jill explains, worker owners make the same rate despite the fact that they have different levels of expertise. They want to try this out to see how it sits with people. Prospective members don’t make as much because they’re spending more time working on training. They’ve had several discussions about paying at different rates for people with different experience, but for now, they’re paying at a common rate. They all work hourly, but there’s an expectation around how much time people work, and an expectation of some flexibility. They’re very aware of the emotional labor involved in tasks like facilitating the consensus process– paying people for the work of facilitation. Ali Hashmi asks questions about worker democracy. Some evidence suggests that worker participation in collective structures is often not very high. Jill notes that there’s simply very little data in the space. Worker collaboratives tend to last much longer than other corporations. Housing coops in New York with 20,000 worker owners have lasted for more than 20 years. Still, while there are some case studies, but there hasn’t been systematic comparison. Ali asks about inherent tensions between workers and management—Jill explains that by leveling the structure and ensuring that each participation has one ownership share and one vote, they attempt to challenge that structure and avoid those conflicts. Consensus decisionmaking processes attempt to challenge these imbalances as well. Erhardt Graeff asks about the process of teaching funders about anti-oppressive technologies. Jill explains that in her work with Hollaback that it’s been a struggle to make that point with funders. As Sassafras, they don’t work directly with funders, but try to support their partner organizations to make the case for anti-oppressive methodologies. A question asks about the difference between peer production and these worker cooperative methods. Jill notes that there’s cooperation in these forms, but notes that worker cooperatives focus closely on the structures used in the workplace, not just on the product built, which can be built through volunteer labor. Rahul Bhargava would love to hear more about how these kinds of processes should be a scaffolding under the creation of all technologies. Jill’s inspired by Shaowen Bardzell’s work on Feminist HCI, using transparency and participation as starting points for evaluating systems . Jill also argues that there’s a need to expand feminist HCI values to consider a broader set of intersectional oppressions. A participant mentioned Resource Generation, a group that organizes people with family money for social change. Is it possible to engage with those people coming from a position of privilege and educating them about ways to build more equitable systems? Jill thinks they’re a very cool group and wonders if it would be possible to work together. We end with a breakout focused on intersectional oppression in academia. Could a democratic workplace address these questions? What barriers exist and where are there opportunities? Previous post What is Civic Innovation in India?